I so totally love Crush. He’s like one of my parenting role-models (and my only fictional, cartoon, anthropomorphized one). So, I was very excited to find the show Turtle Talk with Crush at California Adventure. It turned out to be one of the more amazing things we saw at Disneyland. It so totally rocked! You go into the theatre, the screen is like a big fish tank, complete with waving plant life and the odd fish swimming by. Eventually, an animated Crush (in both senses of the word) shows up and has a talk with the audience. Yes, a spontaneous, let me answer your questions, and ask a few of my own kind of chat. I’m sure there are some scripted responses but the show is essentially different every time. There’s quite a few youtube videos of it, here’s a pretty righteous one. Check it out. Although in this recording it didn’t always appear like the mouth was synching up, when you’re actually there it is. Not only does the mouth of Crush match the words he’s saying, the Crush character will also flip over, wave his fins, swim to a special locale to talk to a specific audience member. What an amazing piece of technology that animation can now be created on the spot like that. 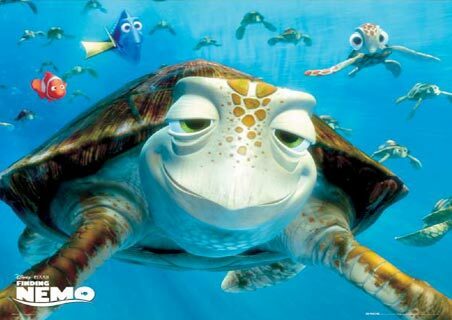 The image of Crush is rendered by voice-activated 3-D animation, projected at 30-frames-per-second so that the turtle’s mouth moves in synchronization with the words of a hidden actor portraying the character. The sophisticated system enables the projected turtle to move about the screen, seemingly propelling himself with his flippers, doing somersaults, and hovering, in very convincing maneuvers controlled by the actor. And apparently, this is wildly popular at Disney World where you have to wait for an hour to get in, but at California Adventure, we only had to wait about 20 minutes and that was for the show to start. We could basically walk right in. The theatre was full, but everyone who was there got in. Awesome Dude! So totally rocks! This entry was posted in Mothership, Observatory, Stardust, summer solstice, Sun and tagged Disneyland, parenting, performing, technology, theatre. Bookmark the permalink.